Dr. Wang's research interest is to study the normal and oncogenic signaling functions of receptor protein tyrosine kinases (RPTKs) and their down stream mediators to identify the basis for cell transformation and oncogenesis. It is also Dr. Wang's interest to identify specific molecular targets for the development of anti-cancer therapeutics. Dr. Wang's laboratory has been studying the human insulin receptor (IR), human insulin-like growth factor I receptor (IGF-1R) and ros oncogene, an activated RPTK originally discovered in an avian sarcoma virus UR2 by Dr. Wang's laboratory. In addition to those RPTKs, Dr. Wang's laboratory is also examining the functional role of Vav3, a GTPase exchange factor, RACK1, a WD motif-containing protein, Twist, a transcriptional factor, and LimCh1/MOST, a newly discovered STAT3 modulator, in cell growth, apoptosis and transformation. Signal transduction pathways responsible for distinct transforming functions of those RPTKs and the above mentioned signaling molecules are being explored. Regulation and intervention of those oncogenic RPTKs and signaling molecules by potential suppressors such as dominant-negative mutants or siRNA are being inquired. Molecular basis for epithelial mesenchyme transition and invasion is being investigated. Potential role of various RPTKs and their downstream signaling molecules in the development and progression of human malignancy, particularly breast, ovarian and prostate cancer, are being examined by cell culture system and animal models including transgenic and orthotopic tumor grafting models. Using normal and oncogenic Ros, IR and IGF-1R, a series of variants have been molecularly engineered and shown to display a wide spectrum of cell transforming ability and oncogenicity. Likewise, mutants of Vav3, RACK1, Twist and Limch1/MOST have also been engineered. These molecular reagents are used to explore the basis for distinct cell transforming properties such as morphological alteration, escape of contact inhibition, anchorage independent growth, resistance to drug-induced apoptosis, enhanced migration/invasion and in vivo tumorigenicity. The wild-type (oncogenic) and the loss of function mutants are compared for their signal transduction pathways and biological functions to identify important molecules mediating various transforming properties. Constitutively activated and dominant negative mutants, as well as RNAi or siRNA vectors of signaling molecules are constructed and used to assess their effect on normal and transforming function of those RPTKs and their down stream signaling molecules. Potential novel substrates of the RPTKs have been investigated using the yeast two hybrid screening assay. Novel signaling molecules identified this way include STAT5, RACK1 and Limch1/MOST for IR and IGF-1R and Vav3 for Ros, insulin, IGF-1 and EGF receptors. To study the kinetics of the signal transducing processes of those RPTKs, temperature sensitive mutants and ligand responsive chimeric receptors were constructed for dissecting the processes. Finally, the role of those RPTKs and their downstream signaling components in the growth and oncogenicity of human breast and ovarian cancer cells have been explored with a series of breast and ovarian cancer lines and tumor tissues. Possible over-expression of certain RPTKs and related mediators including STAT3, Twist and AKT in the tumorigenicity were assessed using various molecular agents described above. 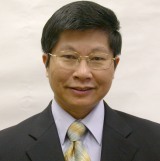 Dr. Wang's early work for the first time established the physical gene map of Rous sarcoma virus. He subsequently discovered novel protein tyrosine kinase (PTK) oncogenes ros and fps and demonstrated the oncogenic potential of human insulin and insulin-like growth factor (IGF)-1 receptors. His research helped to demonstrate cellular origin of the oncogene src transduced by deletion mutants of Rous sarcoma virus, and elucidate the mechanism of the transducing process. Several novel signaling molecules down stream of receptor tyrosine kinases were discovered. They include STAT5 for insulin receptor (IR), RACK1 for IR and IGF-1R, as well as Vav3 for Ros and other receptor PTKs including IGF-1R and EGFR. Distinct signaling pathways down stream of the receptor PTK oncogenes have been identified to be responsible for specific oncogenic properties. For examples, PI3 kinase/AKT and STAT3 pathways are important for anchorage independent growth, Rho GTPase regulates escape of contact inhibition, Vav3 promotes migration and invasion of fibroblasts and prostate cancer cells. Recently, a novel signaling axis, STAT3-Twist-AKT2, was established and shown to control survival, drug resistance and invasive ability of breast cancer cells. Finally, Dr. Wang's recent study showed that rapamycin, a clinically applicable drug, when used in combination with herceptin, a humanized monoclonal antibody against ErbB2, was able to inhibit growth of human breast cancer cells in vitro and in vivo, and more effectively inhibit tumor development and growth in a transgenic model of mammary tumor. 1. Uttamsingh, S, Bao, X., Nguyen, K. T., Bhanot M., Chan J. L.-K., Liu F, Chu T. and Wang, L-H. (2008) Synergistic effect between EGF and TGF-beta 1 in inducing oncogenic properties of intestinal epithelial cells. Oncogene (in press). 2. Wang, L.-H., Chan, J. L.-K. and Li, W. (2007) Rapamycin together with herceptin significantly increased anti-tumor efficacy compared to either alone in ErbB2 over expressing breast cancer cells. Intl. J. Cancer 121:2911-2918. 3. Cheng, G. Z., Chan, J., Sun, C.D., Wang, Q., Zhang, W. and Wang, L.-H. (2007). Twist transcriptionally upregulates AKT2 in invasive breast cancer cells leading to increased migration and survival. Cancer Research 67:1979-87. 4. Zhang, W., Zong, C. S., Hermanto, U., Lopez-Bergami, P., Ronai, Z. and Wang, L.-H. (2005) RACK1 recruits STAT3 specifically to insulin and IGF-1 receptors for activation, which is important for regulating anchorage independent growth. Mol. Cell Biol. 26:413-424. 5. Wang, Lu-Hai (2004) Molecular signaling regulating anchorage-independent growth of cancer cells. The Mount Sinai J. of Medicine 71:361-367. 6. Uttamsingh, Shailaja, Zong, Cong S. and Wang, Lu-Hai (2003). Matrix-independent activation of PI3 kinase, Stat3 and cyclin A-associated Cdk2 is essential for anchorage independent growth of v-Ros transformed chicken embryo fibroblasts. J. Biol. Chem. 278:18798-18810. 7. Sachdev, P., Zeng, L. and Wang, L.-H. (2002). Distinct role of hosphotidylinositol 3-kinase and Rho family GTPases in Vav3-induced cell transformation, cell motility, and morphological changes. J. Biol. Chem. 277:17638-17648.